I knew I would be making sugar cookies around Christmas time, and I also knew I was going to find a new recipe this year. It wasn’t that I didn’t have a good recipe; it was just too much of a good thing. The full recipe yields more than 12 dozen cookies. Talk about a baking marathon! Obviously, I could half, or even quarter, the recipe, but it was also time for a change of texture. Instead of my usual crisp sugar cookies, I was craving some chewy ones. allrecipes.com is my go-to source for recipe browsing, and I quickly found a recipe for lemon sugar cookies. This pantry-friendly recipe does not require lemon juice or zest, so it had potential as a recipe box staple that didn’t require a grocery store run for fresh lemons. Several weeks ago, I shared how much we loved Sonoma Syrup Co. Vanilla Bean Extract “Crush”. Its mellow intensity gave a simple custard incredible vanilla flavor. On the heels of that discovery, I had picked up a bottle of Sonoma Syrup Co. Lemon Extract, and now there was an opportunity to try it. This small-batch extract is made from California lemons using a cold-process method that produces more complex flavor. Its aroma was less harsh than that of another brand of lemon extract I had in the pantry, and it definitely had a more complex bouquet than the national brand. I was hopeful for the same successful outcome as Sonoma Syrup Co. vanilla extract had produced. Reviewers of the lemon sugar cookie recipe frequently suggested increasing the amount of lemon extract, and the recipe below reflects that change. In a medium bowl, cream together butter and 1 cup sugar until light and fluffy. Beat in egg, corn syrup, and lemon extract. Stir in flour, baking soda, and baking powder. Cover dough, and chill in the refrigerator at least 1 hour. Preheat oven to 325°. Line cookie sheets with parchment paper. Roll chilled dough into walnut-sized balls. Roll balls in remaining sugar, and place on the prepared cookie sheet Bake 12 minutes in the preheated oven, or until very slightly golden brown. Allow cookies to cool on the cookie sheet for about 10 minutes, then transfer to a wire rack to complete the cooling process. Makes about 4 dozen cookies. The corn syrup gave the cookies a satisfying, chewy texture. The lemon extract performed as expected, yielding cookies with an intense, yet mellow lemon flavor. It was late afternoon when the last cookie sheet came out of the oven, so enjoying a cup of tea and a warm cookie seemed to be in order. Now, if the dish fairy had just washed the cookie sheets while I was relaxing, it would have been perfect! Using great ingredients in your cooking and baking makes for great taste. Karen Campion, Sonoma Syrup Co.’s founder, has created a stellar line of products that capture the flavors of the Sonoma area. Make Sonoma Syrup Co. your resource for artisanal extracts, simple syrups and bar mixers, breakfast syrups, and cheese accompaniments. There is no way to know how many pounds of chocolate chips I have baked with over the years, but I know it is many…very many. Until recently, I used the leading national brand of chocolate chips without a second thought. Cook’s Illustrated is a valuable resource in understanding the science behind good cooking, and their product reviews are great for choosing the best tools and ingredients. I was more than a little surprised to learn the chocolate chips I had always relied on were on their “not recommended” list. Since Cook’s Illustrated did recommend Ghirardelli Semi-Sweet Chocolate Baking Chips, and I was already a huge fan of Ghirardelli’s brownie mixes, it was a no brainer to give them a try. In a chip-to-chip visual comparison, Ghirardelli’s chips looked like better, darker chocolate than the national brand. The taste test also proved Ghirardelli the better chip with smooth, clean taste compared to the slightly waxy, more artificial taste of the competitor. I could hardly believe the difference, and couldn’t wait to try Ghirardelli’s chips in a recipe for Cappuccino Fudge I had seen on Annie’s Eats, a blog that Karen and I both follow. I was interested in this recipe for several reasons. My mom makes fantastic fudge that her grandchildren would probably fight over had not their parents taught them it was not nice to take fudge from a cousin’s hand, but I like fudge a little creamier than her recipe. I like the consistency of marshmallow fudge, but the popular “Fantasy Fudge” recipe calls for 3 cups of sugar plus super-sweet marshmallow cream. Really? I also thought the Cappuccino Fudge recipe’s mocha and cinnamon flavors would add some depth to the chocolate. Line an 8” square baking pan with aluminum foil; set aside. In a 2 qt. saucepan, combine marshmallow cream, sugar, cream, butter, coffee powder, cinnamon and salt. Bring to a boil over medium heat, stirring constantly. Continue to boil 5 minutes, stirring constantly. Remove from heat. Stir in chocolate chips until smooth. Pour into prepared pan. Cover and refrigerate at least 4 hours. Place on cutting board and cut into 36 squares. I was thrilled with the results. The fudge was quickly prepared and popped into the fridge, with no candy thermometer madness (thank you!). The heavy cream and marshmallow cream yielded a very satisfying creaminess factor, and with 1/6 the sugar of the Fantasy Fudge recipe, chocolate was the flavor star of the show. This fudge probably would have been good if made with another brand of chocolate chips, but with Ghirardelli chips, it was great. Yes, the Ghirardelli chips are more expensive, but if I’m going to invest my time to make homemade treats, why not use the best ingredients? I’ll definitely be buying Ghirardelli chocolate chips from now on, and I’ve also found my go-to fudge recipe! Karen’s mom makes some of the most awesome homemade frosted brownies ever, and I love them. 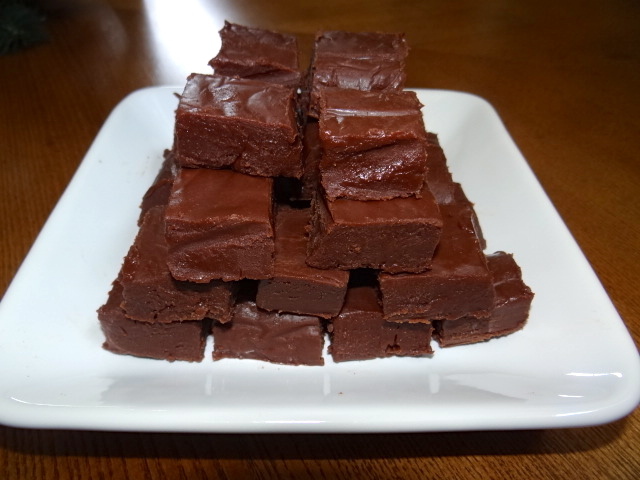 In spite of lots of attempts, I’ve never found my own homemade brownie recipe that delivers really deep fudge chewiness. When I discovered Ghirardelli brownie mixes, I decided to stop looking for that elusive homemade recipe. The tagline on the Ghirardelli brownie box says “Better Chocolate. Better Brownies.” And that, friends, is the truth. There probably isn’t anyone who hasn’t heard of Ghirardelli (Gear-ar-delly) Chocolate. Italian Domingo Ghirardelli came to the United States in 1849, hoping to strike it rich in the California Gold Rush. When his gold mining attempts failed, he began selling supplies and confections to the miners from a tent. That enterprise was successful, so he opened a store and hotel in San Francisco. A devastating fire destroyed his businesses and in 1852, he restarted his career in a candy company that would become Ghirardelli Chocolate Company. More than 160 years later, Ghirardelli is America’s longest continuously operating chocolate manufacturer. The company is very selective about the cocoa beans they process; they roast the beans themselves, and have a proprietary system of processing the roasted beans to deliver smooth, complex chocolate taste. No doubt, their chocolate candies are decadently delicious, but I love their baking products even more. The Triple Fudge Brownie mix combines cocoa, chocolate chips and liquid fudge for a deep, super-rich, chocolate fudge taste. These brownies are a stand-out on their own, but I like to top them with chocolate orange buttercream frosting. I haven’t convinced Karen to try them, as she is not a fan of chocolate-orange combinations, but everyone else has given them rave reviews. Finding a good chocolate buttercream frosting recipe proved to be more challenging than I would have guessed. Since the name of the frosting is “buttercream”, I’m wondering why so many recipes call for shortening, milk or water instead of butter and cream? I adapted a recipe from food.com, adding an orange essential oil which produces intense orange flavor. I’m sure orange extract could be used to your personal taste. Mix and bake brownies as directed for an 8″ x 8″ pan. Remove brownies from oven and immediately cover with foil. (My mom recently told me about this trick, which keeps the brownies moist and prevents the outer edges from forming a hard crust. Pretty amazing.) Let brownies cool completely. Beat butter in a small bowl until creamy. Add sugar and cocoa, mixing well. Stir in cream a tablespoon at a time, mixing well after each addition, until frosting is creamy and spreadable. Add vanilla and orange essential oil. Spread over cooled brownies. Cut into 16 squares and store at room temperature. Ghirardelli baking products are widely available, but there are some nice gift box selections on their website. My fascination with vanilla flavoring goes back to early childhood. I can remember helping my mom bake cakes or cookies, and always begging to open and measure the vanilla extract. I spent more time smelling it and imagining how good it must taste than I did actually measuring it. Mom patiently explained on multiple occasions that the alcohol in extracts were important for good flavoring, but not so much for good taste, at least not straight from the bottle. I was really sure she was wrong, and finally convinced her to let me taste it. After a long anticipatory whiff of the aroma, I poured a little vanilla extract into a teaspoon. My facial expression when I tasted it immediately prompted Mom’s laughter, along with a well-deserved “I told you so!” We also ate a lot of vanilla bean ice cream when I was growing up, and I was addicted to the flavor in those tiny bean specks. I was intrigued by Sonoma Syrup Co.’s combination of vanilla extract and vanilla bean seeds in their Vanilla Bean Extract “Crush”. Madagascar bourbon and Tahitian vanilla beans are the foundation for “Crush”. This small batch product is made from beans ripened on their vines in the South Pacific, then carefully cured and shipped to California for artisan blending. I have been using a quality Madagascar bourbon vanilla for several years, so I was anxious to compare the products. “Crush” easily won the scent assessment, although I certainly don’t have a professionally trained nose. My regular brand had more of an alcoholic edge to it, while “Crush” was mellow. I could easily detect more complex aromas in “Crush”, I’m guessing from the blend of different beans. Taste test? Thank you, but no. (See previous paragraph.) The better test is how the extract performs in use. Because I wanted something simple that would allow the vanilla flavor to shine, I chose Mom’s classic boiled vanilla custard recipe. Whether it was the base for her meringue-topped banana pudding, the filling for my favorite cream puffs, or just served solo as my dad loved it, this custard has always been one of my comfort desserts. Mix the first 3 ingredients together in a heavy saucepan. Stir in the milk (I use a whisk). Cook over medium heat, stirring constantly until it comes to a boil, then boil one minute. Remove from heat. Pour half of the hot milk mixture into a bowl with the beaten egg yolks, beating well. 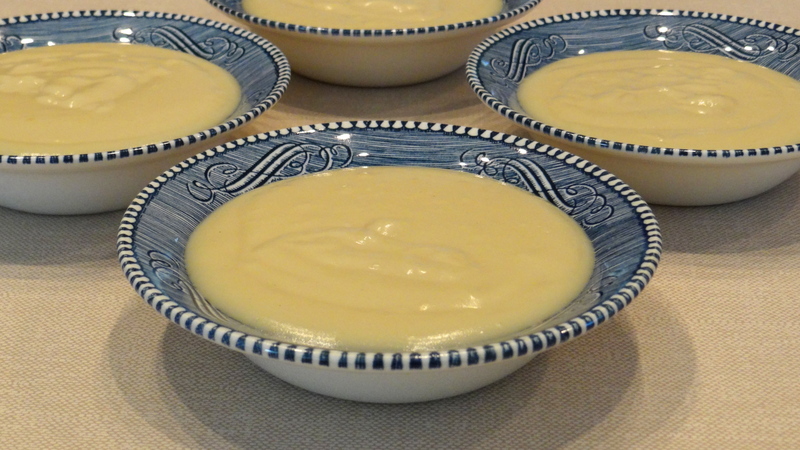 Blend the egg mixture back into the remaining custard in the saucepan, return to heat and bring just to a boil. Cool slightly, then stir in the vanilla extract. Pour into dessert bowls and place plastic wrap directly on the surface of the custard. Serve warm, or refrigerate and serve cold. The result was everything I had hoped for. The vanilla flavor was warm and mellow, and more intense than custard made with my regular extract. I’ve officially made the switch to “Crush”! As you might guess, Sonoma Syrup Co. is based in California wine country. Karin Campion established the company in 2002, adopting the wine-crafting principle of “terroir”, understanding the special characteristics of agricultural products that result from geography, geology and climate interacting with plant genetics. Choosing exceptional ingredients and developing artisanal blends in the company’s extracts, flavored syrups, bar mixers and cheese drizzles has netted multiple industry awards and a very nice list of retailers. You can buy the products directly from Sonoma Syrup Co.’s website, or choose from other online and traditional retailers. The extract gift set (almond, vanilla, and lemon) available from the company website would delight bakers on your holiday gift list! King Arthur Flour, founded in 1790, is America’s oldest flour company – and is wholly owned by us, the employees. The business is based on three pillars: people, planet and profit. We do what’s right for our customers, for ourselves, and for our environment. We are a founding B-Corporation, using the power of business help solve social and environmental problems. We’re motivated by knowing that, every day, people like you count on our flour – on us – to make their baking the best it can be. The company’s website is a wealth of information from recipes, baking tips, videos, and tutorials. King Arthur maintains a baking hotline and online live chat to answer baking questions. An extensive line of baking products and supplies is available on their website, including gluten-free selections. They also have a company store in Norwich, Vermont. Don’t you love this company already? King Arthur Unbleached All-Purpose Flour is as impressive as the company itself. For those who might not know, unbleached flour is not subjected to a chemical bleaching process. Unbleached flour has more protein than flour that has been bleached. It also has a more complex, robust taste. Although some bakers recommend unbleached flour for breads and bleached flour for delicate pastries, King Arthur Unbleached All-Purpose Flour works well for most baking needs. 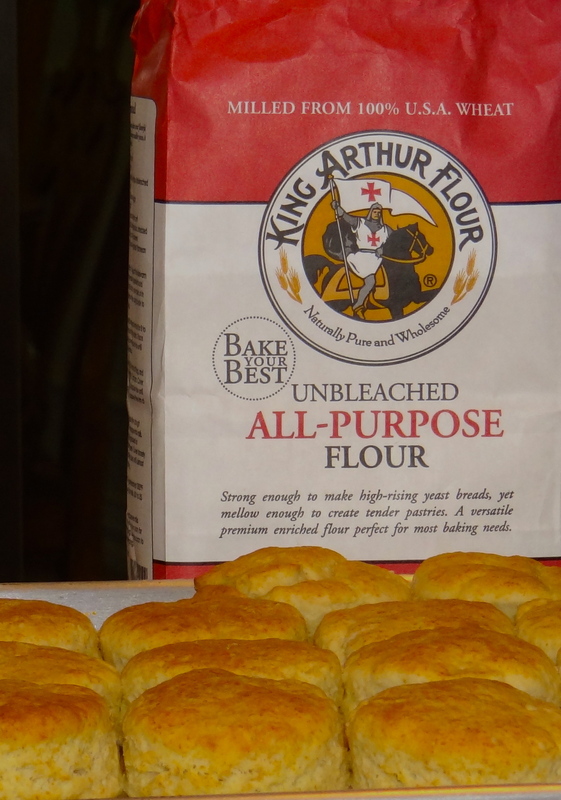 A pan of “from scratch” biscuits is a great way to get acquainted with King Arthur Flour. This recipe comes from fellow East Texan Barbara Richardson McClellan’s cookbook, “From My Kitchen, Once More”, and she credits a cookbook titled “Georgia on My Menu” as the original source. Just one final note – after making the batch of biscuits pictured above with King Arthur flour, we made the same recipe using another national brand unbleached flour. The King Arthur flour batch was clearly superior in appearance, taste and texture. Mix dry ingredients, and cut in shortening. (A food processor works great, but you can use a pastry blender, or 2 table knives.) Add the milk all at once, and stir only slightly. Place dough on slightly floured surface and knead very gently for only a few seconds. Roll into 1/2″ thickness. Cut with a biscuit cutter, cookie cutter or small glass, dipping the cutter into flour before each cut. (Note: press the cutter straight down; do not twist it back and forth.) Place on ungreased cookie sheet and bake for 10-12 minutes until lightly golden brown. Makes 8 – 12 biscuits, depending on size of the cutter.